Radraft provides users with a comprehensive drafting solution for all your 2D design and drawing needs. Although easy to use Radraft has many advanced features to assist with the quick production of drawings and parts. With its compact GUI (Graphical User Interface) users can access a wealth of drawing tools and parametric profiles. 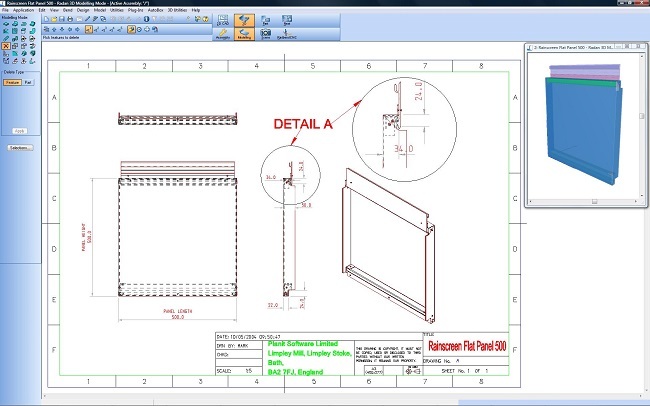 Radraft is a highly productive tool that will meet all your engineering drawing needs. The full toolset of drafting functionality is available for all other 2D geometry tasks within RADAN. Whether it is a drawing, a sheet metal profile in RADAN 3D, a sheet metal part in Radpunch or Radprofile, the full power of Radraft geometry construction tools is available. The standard toolset made available in Radraft, reduces training requirements, eases deployment and delivers higher productivity. Radraftӳ compact user interface presents the user with a complete set of drawing tools organized in a logical way. Similar commands are grouped together and sub menus appear only when required and applicable to the task in hand. Radraft Geometry Utility can simplify or smooth the geometry profiles. Some file types can support complicated splines or arcs and consequently represent these by using many very short straight line segments. Such profiles can be difficult to work with and can cause problems when trying to apply tooling in the manufacturing process. RADAN Geometry Utilities can greatly speed up the process of cleaning and working with imported data, greatly improving drawing productivity and quality. Intelligent and easy to control latch and snap settings allow the user to quickly construct drawing profiles. Automatic Horizontal, Vertical and point snapping, among others, allow the user to be quick but highly accurate when constructing geometry. In addition middle mouse Zoom, Pan and Redraw combine to make Radraft an efficient and highly productive drawing tool. Standard notes can be saved as symbols for later retrieval on the same drawing or used across multiple drawings. Text can be exploded back to lines and arcs for use in profile cutting in conjunction with Radpunch, Radprofile or used in 3D modelling in conjunction with RADAN 3D.